Getting a little bit personal here, which is something I rarely do. But blogs are just that: personal. So here it goes.. This picture seems like it was a lifetime ago compared to how far we have come since then. For those of you who are in a military relationship, you have experienced a type of struggle and hardship that few will ever understand. I was never the type of person who was very good at sharing my feelings, so when Kyle began thinking about the Army, I didn’t share my opinion for a little while. We had been dating for almost 2 years, and he was my very best friend. He was my person, and I didn’t want to lose him. But that’s the part of this type of relationship that some of you will understand: I had to make a sacrifice, just like he has. I remember the day it happened like it was yesterday. Kyle was driving me home after our usual date night, and there was this silence between us. The night had been perfect, like all the nights I got to be with him, but there was something being exchanged between the two of us, that even I didn’t fully understand. Kyle’s father was in the Army from before Kyle was born, up until he was very young, so I was always aware of the impression that it had made on him. He wanted to serve his country for his father, but also for his own sake. He wanted to prove to himself that he could be more than he was. And over time, I realized that it was more than just an idea in his mind, but something he was meant to do. As we approached my house that night, I looked over at him with an ache in my heart, and told him he needed to do this. On April 8th of 2013 Kyle swore into the Army National Guard, and about 3 months later, he left for basic training in Fort Benning, Georgia. 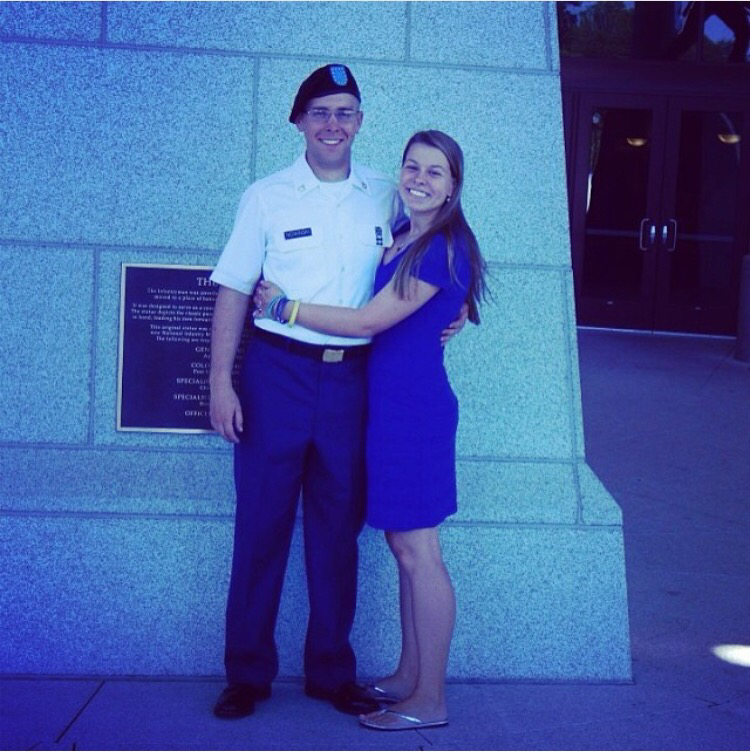 After graduating, he moved on to AIT (MOS school) in Fort Rucker, Alabama, where he became a Blackhawk mechanic. He was gone for about 7 months, before coming home and being accepted into his unit. I never went into detail with him about the things I went through while he was gone, because I never wanted him to wonder about the decision he made. I wanted him to be the very best version of himself, and every day he finds a new way to be that person. Even in his absence he inspired me, made me strong, made me proud, and made me love him more than I ever thought a person could love another. For those of you who have experienced a long distance military relationship, whether it be for a few months or a year or even more, you understand the hardship that many go through. I would find myself crying while I folded laundry, or suddenly angry for no reason at all. It was like an emptiness inside me that just hurt. Sometimes when I thought of him it was like all the wind got knocked out of me. It’s been almost 3 years since the day I looked at him, and told him to follow his dreams. Rather than changing his life, it changed both of our lives, and the life that we have grown together. I know that his job is dangerous, and that every time he gets deployed it will only become more dangerous. I know that our lives could change again, for better or for worse. But those are the things that I sacrificed with him. And I would do it again. Given the choice, I would choose you.. Every time. I totally can relate to the feelings you expressed that you felt when he left… suddenly being angry for no reason at all or crying when doing regular every day chores. It’s really hard and a really complex emotional experience. Im happy you realize you are strong and your relationship is very strong too! Kyle is one lucky guy to have such an understanding and strong partner, I am sure that made the transition easier for him knowing that he had you to go back home to. Thank you very much 🙂 I like to think I was a good support system, and that I will be when he leaves again. I just do my very best. Thank you for the kind words! Finding people who go through the same stuff and know what you feel like makes life so much easier! I felt the same way when I first started my blog! We are all here to offer support 🙂 thank you so much for reading! You are definitely not alone in your feelings here ❤ When my husband was deployed early this year, it was because he volunteered. And at first, I was so upset at the idea. Why go when you don't HAVE to go? It wasn't until I really stepped back and saw the situation through his eyes that I realized he does have to go. This is what he needs to do, not only for his country, but for himself.